Hiring? Toptal handpicks top algorithm developers to suit your needs. You hear a familiar song in the club or the restaurant. You listened to this song a thousand times long ago, and the sentimentality of the song really touches your heart. You desperately want to heart it tomorrow, but you can’t remember its name! Fortunately, in our amazing futuristic world, you have a phone with music recognition software installed, and you are saved. You can relax, because software told you the name of the song, and you know that you can hear it again and again until it becomes a part of you…or you get sick of it. Mobile technologies, along with the huge progress in audio signal processing, have given us algorithm developers the ability to create music recognizers. One of the most popular music recognition apps is Shazam. If you capture 20 seconds of a song, no matter if it’s intro, verse, or chorus, it will create a fingerprint for the recorded sample, consult the database, and use its music recognition algorithm to tell you exactly which song you are listening to. But how does Shazam work? Shazam’s algorithm was revealed to world by its inventor Avery Li-Chung Wang in 2003. 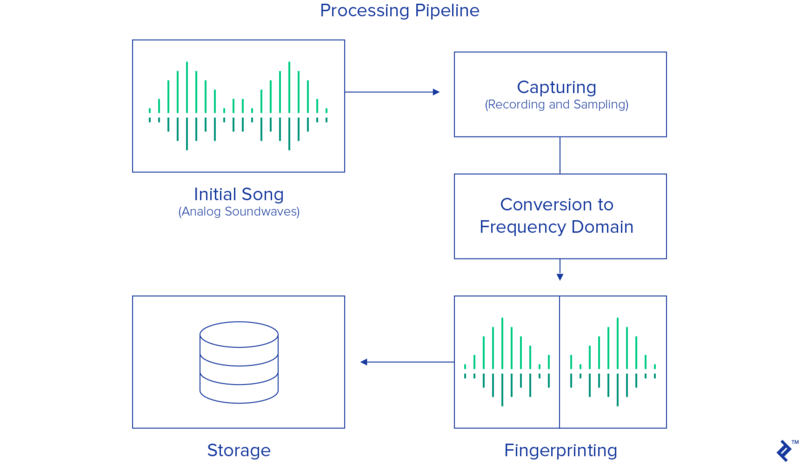 In this article we’ll go over the fundamentals of Shazam’s music recognition algorithm. What is sound really? Is it some sort of mystical material that we cannot touch but which flies into our ears and makes us hear things? Of course, this is not quite the case. We know that in reality, sound is a vibration that propagates as a mechanical wave of pressure and displacement, through a medium such as air or water. When that vibration comes to our ears, particularly the eardrum, it moves small bones which transmit the vibration further to little hair cells deep in our inner ear. Finally, the little hair cells produce electrical impulses, which are transmitted to our brain through the auditory ear nerve. Recording devices mimic this process fairly closely, using the pressure of the sound wave to convert it into an electrical signal. An actual sound wave in air is a continuous pressure signal. In a microphone, the first electrical component to encounter this signal translates it into an analog voltage signal - again, continuous. This continuous signal is not so useful in the digital world, so before it can be processed, it must be translated into a discrete signal that can be stored digitally. This is done by capturing a digital value that represents the amplitude of the signal. The Nyquist-Shannon Theorem tells us what sampling rate is necessary to capture a certain frequency in continuous signal. In particular, to capture all of the frequencies that a human can hear in an audio signal, we must must sample the signal at a frequency twice that of the human hearing range. The human ear can detect frequencies roughly between 20 Hz and 20,000 Hz. As a result, audio is most often recorded at a sampling rate of 44,100 Hz. This is the sampling rate of Compact Discs, and is also the most commonly used rate with MPEG-1 audio (VCD, SVCD, MP3). (This specific rate was originally chosen by Sony because it could be recorded on modified video equipment running at either 25 frames per second (PAL) or 30 frames per second (using an NTSC monochrome video recorder) and cover the 20,000 Hz bandwidth thought necessary to match professional analog recording equipment of the time.) So, when choosing the frequency of the sample that is needed to be recorded you will probably want to go with 44,100 Hz. What we have in this byte array is signal recorded in the time domain. The time-domain signal represents the amplitude change of the signal over time. In the early 1800s, Jean-Baptiste Joseph Fourier made the remarkable discovery that any signal in the time domain is equivalent to the sum of some (possibly infinite) number of simple sinusoidal signals, given that each component sinusoid has a certain frequency, amplitude, and phase. The series of sinusoids that together form the original time-domain signal is known as its Fourier series. In other words, it is possible to represent any time domain signal by simply giving the set of frequencies, amplitudes, and phases corresponding to each sinusoid that makes up the signal. This representation of the signal is known as the frequency domain. In some ways, the frequency domain acts as a type of fingerprint or signature for the time-domain signal, providing a static representation of a dynamic signal. The following animation demonstrates the Fourier series of a 1 Hz square wave, and how an (approximate) square wave can be generated out of sinusoidal components. 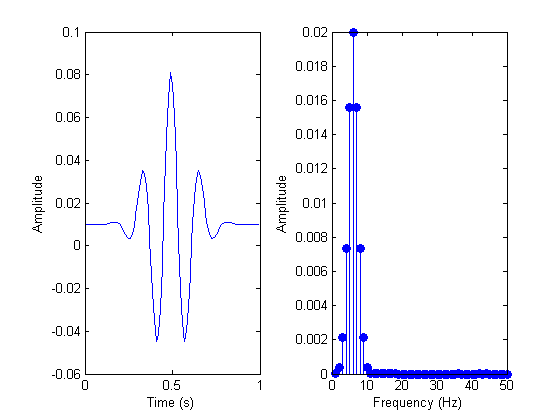 The signal is shown in the time domain above, and the frequency domain below. Analyzing a signal in the frequency domain simplifies many things immensely. It is more convenient in the world of digital signal processing because the engineer can study the spectrum (the representation of the signal in the frequency domain) and determine which frequencies are present, and which are missing. After that, one can do filtering, increase or decrease some frequencies, or just recognize the exact tone from the given frequencies. So we need to find a way to convert our signal from the time domain to the frequency domain. Here we call on the Discrete Fourier Transform (DFT) for help. The DFT is a mathematical methodology for performing Fourier analysis on a discrete (sampled) signal. It converts a finite list of equally spaced samples of a function into the list of coefficients of a finite combination of complex sinusoids, ordered by their frequencies, by considering if those sinusoids had been sampled at the same rate. One of the most popular numerical algorithms for the calculation of DFT is the Fast Fourier transform (FFT). By far the most commonly used variation of FFT is the Cooley–Tukey algorithm. This is a divide-and-conquer algorithm that recursively divides a DFT into many smaller DFTs. Whereas evaluating a DFT directly requires O(n2) operations, with a Cooley-Tukey FFT the same result is computed in O(n log n) operations. One unfortunate side effect of FFT is that we lose a great deal of information about timing. (Although theoretically this can be avoided, the performance overheads are enormous.) For a three-minute song, we see all the frequencies and their magnitudes, but we don’t have a clue when in the song they appeared. But this is the key information that makes the song what it is! Somehow we need to at know what point of time each frequency appeared. That’s why we introduce kind of sliding window, or chunk of data, and transform just this part of the information. The size of each chunk can be determined in a few different ways. For example, if we record the sound, in stereo, with 16-bit samples, at 44,100 Hz, one second of such sound will be 44,100 samples * 2 bytes * 2 channels ≈ 176 kB. If we pick 4 kB for the size of a chunk, we will have 44 chunks of data to analyze in every second of the song. That’s good enough density for the detailed analysis needed for audio identification. In the inner loop we are putting the time-domain data (the samples) into a complex number with imaginary part 0. In the outer loop, we iterate through all the chunks and perform FFT analysis on each. Once we have information about the frequency makeup of the signal, we can start forming our digital fingerprint of the song. This is the most important part of the entire Shazam audio recognition process. The main challenge here is how to distinguish, in the ocean of frequencies captured, which frequencies are the most important. Intuitively, we search for the frequencies with the highest magnitude (commonly called peaks). However, in one song the range of strong frequencies might vary between low C - C1 (32.70 Hz) and high C - C8 (4,186.01 Hz). This is a huge interval to cover. So instead of analyzing the entire frequency range at once, we can choose several smaller intervals, chosen based on the common frequencies of important musical components, and analyze each separately. For example, we might use the intervals this guy chose for his implementation of the Shazam algorithm. These are 30 Hz - 40 Hz, 40 Hz - 80 Hz and 80 Hz - 120 Hz for the low tones (covering bass guitar, for example), and 120 Hz - 180 Hz and 180 Hz - 300 Hz for the middle and higher tones (covering vocals and most other instruments). Now within each interval, we can simply identify the frequency with the highest magnitude. This information forms a signature for this chunk of the song, and this signature becomes part of the fingerprint of the song as a whole. Note that we must assume that the recording is not done in perfect conditions (i.e., a “deaf room”), and as a result we must include a fuzz factor. Fuzz factor analysis should be taken seriously, and in a real system, the program should have an option to set this parameter based on the conditions of the recording. To make for easy audio search, this signature becomes the key in a hash table. The corresponding value is the time this set of frequencies appeared in the song, along with the song ID (song title and artist). Here’s an example of how these records might appear in the database. If we run a whole library of songs through this music identification process, we can build up a database with a complete fingerprint of every song in the library. 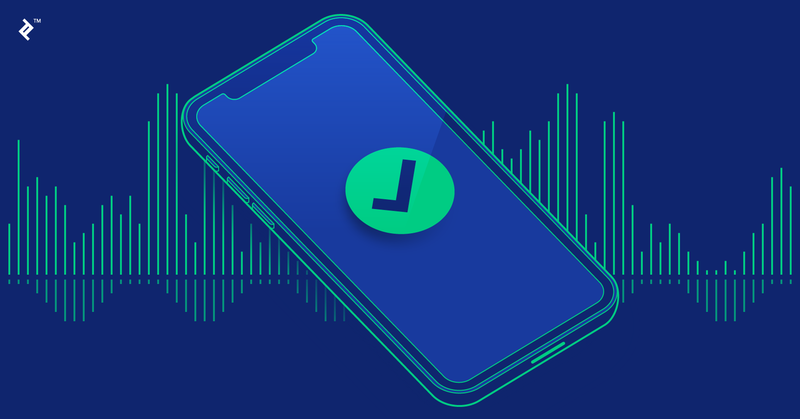 To identify a song that is currently playing in the club, we record the song with our phone, and run the recording through the same audio fingerprinting process as above. Then we can start searching the database for matching hash tags. As it happens, many of the hash tags will correspond to the music identifier of multiple songs. For example, it may be that some piece of song A sounds exactly like some piece of song E. Of course, this is not surprising - musicians have always “borrowed” licks and riffs from each other, and these days producers sample other songs all the time. Each time we match a hash tag, the number of possible matches gets smaller, but it is likely that this information alone will not narrow the match down to a single song. So there is one more thing that we need to check with our music recognition algorithm, and that is the timing. The sample we recorded in the club might be from any point in the song, so we cannot simply match the timestamp of the matched hash with the timestamp of our sample. However, with multiple matched hashes, we can analyze the relative timing of the matches, and therefore increase our certainty. For example, if you look in the table above, you will see that hash tag 30 51 99 121 195 corresponds to both Song A and Song E. If, one second later, we match the hash 34 57 95 111 200, that’s one more match for Song A but in this case we know that both the hashes and time differences matches. This gives us flexibility to record the song from the beginning, middle, or end. Finally, it is unlikely that every single moment of the song we record in the club will match every corresponding moment of the same song in our library, recorded in the studio. The recording will include a lot of noise that will introduce some error in the matches. So instead of of trying to eliminate all but the correct song from our list of matches, at the very end, we sort all the matched songs in descending order of likelihood, and our favorite is the first song on the ranking list. For this kind of system, the database can get pretty huge, so it is important to use some kind of scalable database. There is no special need for relations, and the data model ends up being pretty simple, so it is a good case for using some kind of NoSQL database. This kind of song recognition software can be used for finding the similarities between songs. Now that you understand how Shazam works, you can see how this can have applications beyond simply Shazaming that nostalgic song playing on the taxi radio. For example, it can help to identify plagiarism in music, or to find out who was the initial inspiration to some pioneers of blues, jazz, rock, pop or any other genre. Maybe a good experiment would be to fill up the song sample database with the classical music of Bach, Beethoven, Vivaldi, Wagner, Chopin and Mozart and try finding the similarities between songs. You would think that even Bob Dylan, Elvis Presley and Robert Johnson were plagiarists! But still we cannot convict them, because music is just a wave that we hear, memorize and repeat in our heads, where it evolves and changes until we record it in the studio and pass it on to the next great musical genius. How does the Shazam algorithm work? The Shazam algorithm distills samples of a song into fingerprints, and matches these fingerprints against fingerprints from known songs, taking into account their timing relative to each other within a song. What is an audio fingerprint? An audio fingerprint is a collection of hash tags, or signatures, of a song's samples. They measure which frequencies in each sample are the strongest. How does Shazam find music? Shazam finds music by comparing the audio fingerprint of a user-supplied recording with fingerprints of known songs from its database. Great insights, thanks for sharing! Great stuff ! Thanks ! Genius on the part of Shazam. And the author does a great job at explaining the concepts. Very interesting stuff. Few years ago there was the case when another guy described how Shazam's sound recognition algorithm works and Shazam lawyers chased that guy. Yes, that's the guy who inspired me. But after threatening emails he needed to remove the source code from blog. Thank you for such great article! Thanks for noticing this mistake. This is actually true for MEMS microphones so it will be corrected. I think this needs a lot more tuning for it to practically work. First of all, it would work better if charateristic frequencies match tones in tempered scale better, also tracking only amplitude component (as per DCT for example) would make fuzzyness more forgiving because phases will vary more greatly depending on where in space the microphone is positioned. Finally, additional tempo counting and matching (which is a separate algorythm but can be performed in FFT domain as well) would probably improve recognition and reduce weight of false positives. Thank you Jovan, That is a pretty insightful article, I think it mainly describes the early versions of Shazam, they should have a very well trained neural network to look up hashes of any chunk of a song by now. Also there should be more advanced algorithms and fine tuning with fuzzy logic to select the best match out of the list of songs, it can also use parameters provided by the client context. Anybody has seen any patent registered to them? Studying it can be insighful too. Absolutely agree. Main problem would be to find fundamental frequencies which is much harder with polyphonic melodies. This would demand some harmonic, stochastic model or combination of those two. Also agree about phase, it should be tracked. I think it would be possible to construct a harmonic wavelet domain with frequencies matching twelve tones of chromatic tempered scale across octaves. FFT isn't logarythmically distribut but linear, so FFT or it's derivatives probably wouldn't work. Infact I beleive it's akin to what Melodyne uses to deconstruct polyphonic melodies. Perhaps a patent on that could be hunted down. It's kinda hard reverse engineering his "dumbed down for SOS readers" explanation to match bits of DSP I know about that are likely behind it, but thanks. It's still a great read. i would've used a sonogram waveform instead of fft as a method for fingerprinting. What ever floats your boat. I also wanted to ask you if you have an open source code! It would help me with my actual university project. Please let me know as soon as you can! Mail: [email protected] Thank you! Today, a lot of companies implement "Music Recognition" by integrating ACRCloud ( https://www.acrcloud.com ) SDKs ( https://github.com/acrcloud ) or using its Web APIs. ( https://docs.acrcloud.com ). ACRCloud is one of the best performance and most esay-to-use cloud services. Register for free: https://console.acrcloud.com/signup . Actually, a lot of companies implement "Music Recognition" by integrating ACRCloud ( https://www.acrcloud.com ) SDKs ( https://github.com/acrcloud ) or using its Web APIs. ( https://docs.acrcloud.com ). ACRCloud is one of the best performance and most esay-to-use cloud services. Register for free: https://console.acrcloud.com/signup . What the method(s) exactly used here? We are using the music monitoring stuff provided by ACRCloud, it's giving us results and doing so quite well. What about tempo detection? Humans we do in a few seconds, is there any algorithm for that? Any complete source code available ? It's so information article, thank you. I was always wondering how music recognition app works. Try to add this insightful article on wiki page about Shazam: http://getsmall.link/6bd4c48f. Thank you for this excellent article, Jovan, very elucidative. How could one use this for movies, which includes speech recognition and sound effects more so than actual music? I suppose it wouldn't be as simple as using different intervals, right? did you find any solution? I am working on an android application! Hello, I am a college student in Korea. Recently I am researching SHAZAM, a music search industry in the big data industry.I read a wonderful algorithmic analysis, but I was wondering if I had a major problem. Can you tell me about the value of the song A, for instance the song A first value 30 (30,51,99,121,195) is in 53.52 time in seconds. I am sorry that I am not good at English and thank you again for this wonderful article. The only question I have (and if it's a stupid or easy one, please feel free to answer me as soon as possible) is where did the highscores array come from. Could someone explain/define it for me. Much appreciated everyone. Thanks for the response Pham..What I'm asking is what values are used to initialize the highscores array..I'm seeing it used before it's declared or assigned. Thanks in advance. Ok..so if I'm understanding it correctly, I should initialize highscores as int[t] where t is the sample size (4096 in my case) and 5 is as high as the index will go. Then I should declare all its values as zero. Then I should check if the calculated magnitude at that frequency is greater than the highscore at that [t][index] position..which will always be zero. am I on the right track so far? Yes. This also correct for "points" if you wonder where it come from. Thanks Pham..I'll revisit what I have..Is it okay if I send you my implementation of the algorithm for you to take a look at? Sorry. I read this 2 years ago. Google bring me back here, so I don't have time to look at your code, I also don't have java environment installed on my computer. I can only answer if you have specific question. How do you identify the start/end of a chunk? Because if this is not aligned with a recording to be identified, the hashes won't match. Thanks. Sound Great, Can you Help me i Have Purchased plan Of ACRCloud and i am looking for how this serivce helps to identify copyrights. Jovan is an entrepreneur and engineer with a strong mathematical background. He doesn't care about the technology but cares about the problem that the technology can solve.